Sure to be a day Danielle Jones will Never Forget, the newlywed could not believe her eyes when the Take That star arrived at the event in Berkshire on Friday. It was all part of an elaborate plan started by her friends Kirsty Miles and Becky Young. 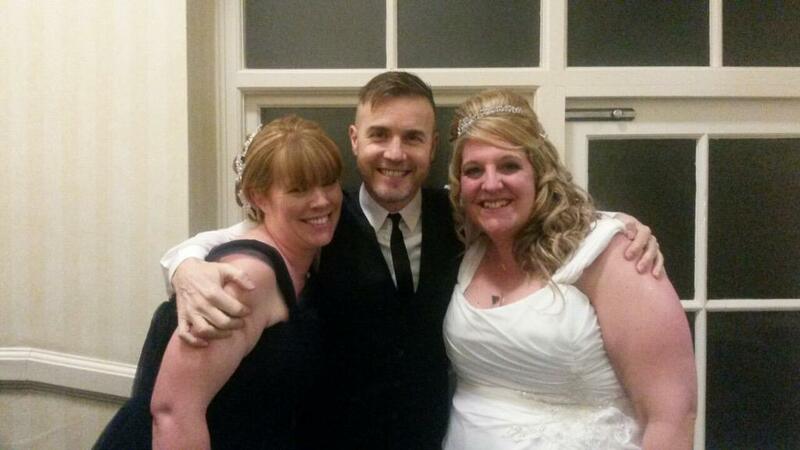 Following Gary's pledge in January that he would surprise three bridal parties throughout the year, the pair started a campaign to make sure their friend's wedding one of them. Then one day Gary sent a message to maid of honour Kirsty to say it was on - but to keep it secret from the bride. "He messaged her to say that he was out of the country," Kirsty told ITV News. "He was quite funny about it." Bridesmaid Becky said keeping a straight face before the big reveal was hard. "So many times I wanted to tell her," Becky told ITV News. "The night before we were having Chinese and she was tweeting him saying I can't believe you're not coming!" Kirsty agreed, saying it was "very hard" to keep such a big secret as she and Danielle had been friends for 24 years. "But it was all worth it," she smiled. "He was the icing on the cake ... even the next morning she looked shocked," Becky added.